With all the Christmas festivities now over, and with Valentine’s Day looming, now is the perfect time to be planning a special getaway for two. We have come up with a variety of destinations and properties to entice you to start planning that romantic springtime break! 1. Paris … well, we had to start with Paris… the ultimate romantic destination, and what could be more romantic than staying at Le Bateau, a houseboat on the Seine, almost at the foot of the Eiffel Tower! Accessed by a tree-lined, cobblestone quai, there are expansive views of the Seine and the Beaux-Arts architecture of Passy from its deck-terrasse, where you can sit and enjoy a morning coffee or cocktail in the evening. The interiors are exceptionally spacious (800 sq. ft) and comfortable, with polished wood panelled walls and floorboards and a king-size bed in the cosy bedroom. 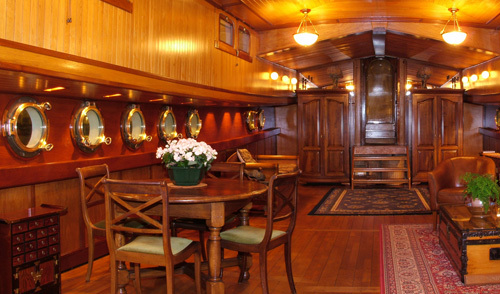 The boat is equipped with TV and wi-fi internet connection, and there are two bicycles available for exploring Paris. Nearby sights include a twice weekly open-air market, a good selection of restaurants and cafés and, of course, the numerous historical sites in this fascinating part of Paris. Guide price: €2170 per week. 2. Venice is another personal favourite, and of all the places we have ever stayed in Venice, there is nowhere quite like Le Residenze for a truly memorable romantic break. Situated on Giudecca Island, directly facing San Marco across the lagoon, Le Residenze dates back to the 16th century when it was the home of a Venetian noble family. It has recently been renovated, retaining all its original grandeur, including wall frescoes and Venetian terrazzo floors, to create 11 superb apartments, a reading room and wine bar with working fireplaces and an impressive ‘winter garden’ lobby. The latter opens both to the front of the building and views of San Marco, and to the rear where there is a stunning three acre private garden, with swimming pool. Among the many guest privileges is the use of the adjoining Palladio’s Spa, as well as complimentary boat transfers (a 4 minute ride) to Piazza San Marco. Guide price: €1200 per night. Minimum stay 4 nights. 3. When asked to recommend romantic breaks, apart from the cities like Paris and Venice, we always immediately think of Santorini, and any time from Easter to the end of October is a great time to go, maybe avoiding the crowded high season months of July and August, if it is a romantic break you are after! 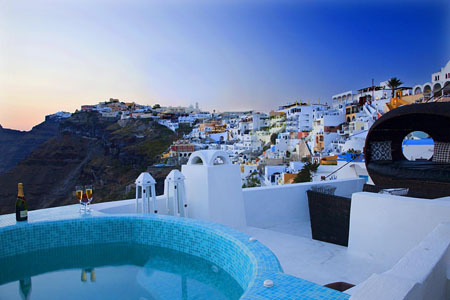 And of course, you must make sure you stay in a villa with a Caldera view … somewhere like the aptly named Fira Dream would be perfect. Perched high on a clifftop above the spectacular Caldera, this 17th century ‘canava’ has been refurbished to the highest of standards, yet without losing its traditional, simple Cycladic style. Access is via a courtyard into a large living area with high vaulted ceilings. From here, a handmade stained glass door leads to the master bedroom with circular bed and a Jacuzzi set with mosaic glass tiles. The villa has two terraces, one with rooftop jacuzzi, to take full advantage of the breathtaking views and sunsets. The village centre of Fira with a great selection of bars and tavernas, some again in magnificent cliffside locations, is just a few minutes walk away. Airport transfers and a continental breakfast each morning are included in the rental price. Guide price: €340 per night. Minimum stay 3 nights. 4. The Greek Islands offer so much in the way of romantic properties, you are spoilt for choice, but Petra Villa on Patmos, recently added to our programme, did catch our attention as being an idyllic retreat for a quiet, romantic break. The villa dates back to 1542 and is one of the oldest houses in the traditional village of Chora, known as one of the most picturesque villages in Greece, and a UNESCO World Heritage Site. With its maze of narrow, cobbled streets and white-washed houses, cars will need to be left in a car park at the entrance to the village, from where it is a 5 minute walk to the villa. Quaint and charming , the interiors are furnished with antiques, yet offer all modern comforts, including air conditioning, wi-fi access and home cinema. A traditional patio at ground floor level is furnished with a large marble dining table, sofas and chairs, while a furnished roof terrace right at the top of the house, has amazing views to the sea and the famous Monastery of St John. Guide price: €800 per night (can request special rates out of high season for just one couple). Minimum stay 3 nights. 5. If asked to suggest a totally unique and extraordinary out of season romantic break, by the sea, in Europe, we would have no hesitation in suggesting the magnificent Palazzo Santa Croce in Positano. Situated high above the town (about 10 - 15 minutes walk down to the town centre and beach), there are wonderful views over the picturesque town, the dramatic coastline and the sea. Dating from the 1700’s, the property has been wonderfully preserved and still features the original lacquered doors, painted ceilings and original stucco work. It also has a fascinating history of famous guests, including Picasso, Steinbeck and Alberto Moravia. The current owners have restored the building to all its former glory and more! It is rare to see such exquisite taste and attention to detail – the end result being a haven of relaxation, combined with enormous beauty and a true sense of the property’s history and culture. Among the many exceptional features are the two master bedrooms, with their frescoed ceilings, decorated and furnished in opulent Baroque style, with enormous paintings, columns, mirrors and silks. There is a large terrace, furnished for relaxing and dining outdoors (and with a long hydro-massage tub!) and, on a lower level, a luxurious spa, with heated pool, with fountain and contra-flow jets for lumbar and cervical massages. Breakfast is served each morning with juice squeezed from the property’s own lemon and orange trees, home-made marmalade and home-baked pastries….. don’t be put off by the price of such perfection – the owners will reduce the price for couples staying. And if the romantic break leads to a wedding, there is even a consecrated chapel! Prices on request. Usually one week minimum stay, but shorter stays allowed out of high season. 6. While on the subject of Palazzos and Italy … there is always Rome to consider too. Here we are renting a luxurious and unique apartment in a 16th century Palazzo, right in Via Condotti, one of Rome’s finest shopping streets, and a 5 minute walk from the Spanish Steps and the Trevi Fountain. Steeped in history, and one the residences of Emperor Napoleon III, who lived here in 1830, the one bedroom apartment has been restored to all its former splendour. Entrance to the Palazzo is through massive wooden doors and along an arcade of Doric columns with ancient artefacts on display. 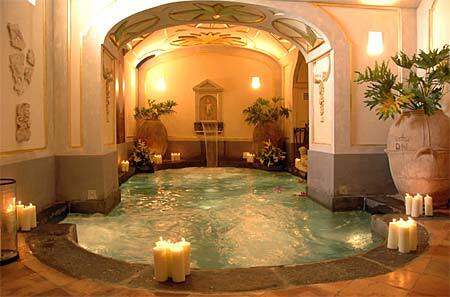 Guests can reach the apartment by elevator, or by the grand marble staircase lined with antique busts of Roman emperors. The apartment (about 2350 sq. 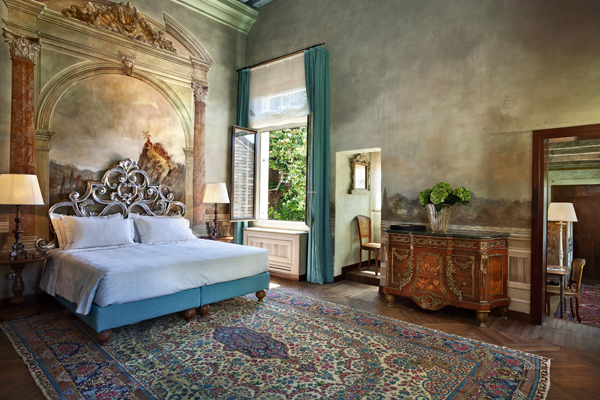 ft) has parquet floors, hand-stencilled walls, antique furnishings, huge oil paintings and 16th century tapestries. One painting in the bedroom, opens to access an exquisite marble bathroom! This has to be one of the most amazing places to stay in Rome, and definitely on the short list of a very special occasion. Continental breakfast each morning is included in the price. Guide price: €1500 per night. Minimum stay 3 nights. 7. If the idea of a Mediterranean Island appeals, offering sunshine and beauty out of high season, then our small villa, Pequena Deia, in the charming village of Deia on Mallorca might appeal. A former artists’ colony, Deia is a beautiful stone-clad village with no less than three Michelin star restaurants (and lots of other restaurants and tapas bars), art galleries, boutiques and fabulous sea views. There is even a small beach, two kilometres from the village, an 18-hole golf course 20 minutes away and Spa facilities at the nearby Residencia Hotel. Our very pretty, traditional stone house here is about 15 minutes walk from the village. Formerly a Priests’ sanctuary, the house retains its authentic charm, with white-washed walls, original exposed ceiling beams and painted wooden shutters. There is a terrace with swimming pool and sea views. Guide price: €2275 per week. Minimum stay one week. 8. Also by the sea, and offering much in the way of authentic charm, is our Dubrovnik Apartment. It is hidden away in a quiet street, just steps away from Stradun, the main promenade in the old town. The Rector’s and Sponza Palaces, the Cathedral, St Blaise’s Church, Europe’s oldest pharmacy (housed with the Franciscan Monastery), Mariin Drzic Theatre, museums and art galleries are all within a short walk, as are Dubrovnik’s finest restaurants, cafés and the ferry to the beaches on romantic Lokrum Island…. a perfect base for exploring this captivating city. The interiors of the apartment are very tasteful with exposed stone walls, original ceiling beams and flooring, and an antique ‘Windof’, used for open fire cooking more than a hundred years ago. The apartment is equipped with all modern amenities and the owner can arrange for breakfast delivery for guests on request. Guide price: €250 per night. Minimum stay 4 nights. 9. St Tropez is fabulous out of high season, and we have the perfect small villa, L’Escale Beach, right by the sea, for couples looking for peace and privacy, yet easy access to St Tropez village, just 15 minutes drive away. The pretty bougainvillea-filled garden at the front of the house has a heated pool, and direct beach access to L’Escalet Plage. There are two large covered terraces to relax or enjoy meals ‘al fresco’. Price for 2 people out of high season on request. Minimum stay one week. 10. Last, but not least, London is also a great city for a romantic break and we are offering some very charming, quintessentially English-style apartments in an Edwardian building in Cadogan Gardens – just behind Sloane Square and a quick stroll away from the Kings Road, Sloane Street and Knightsbridge. The Draycott Apartments are part of a boutique hotel and guests will benefit from hotel facilities, including a 24 hour reception and room service. Additional thoughtful touches include complimentary tea and biscuits in the drawing room at 4 p.m., a glass of champagne at 6 p.m. and hot chocolate at 9.30 pm.! A stay here is really like a home away from home, in particularly relaxing, hospitable and luxurious surroundings. Guide price: €325 per night. Minimum stay one night. This press release was distributed by ResponseSource Press Release Wire on behalf of The City Apartment Book Ltd in the following categories: Men's Interest, Women's Interest & Beauty, Food & Drink, Travel, for more information visit https://pressreleasewire.responsesource.com/about. Release from The City Apartment Book Ltd.